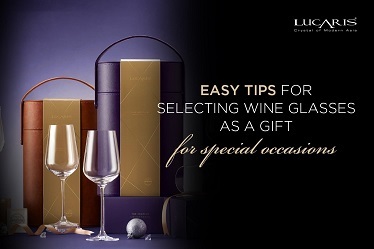 A wine lover such as yourself should know how important a glass is for your favorite wine and if you are interested in wine glasses, certainly you should have heard of a wine glass made of crystal which reflects a refined quality with elegant design. So what is it that makes a crystal wine glass so different from a normal wine glass? 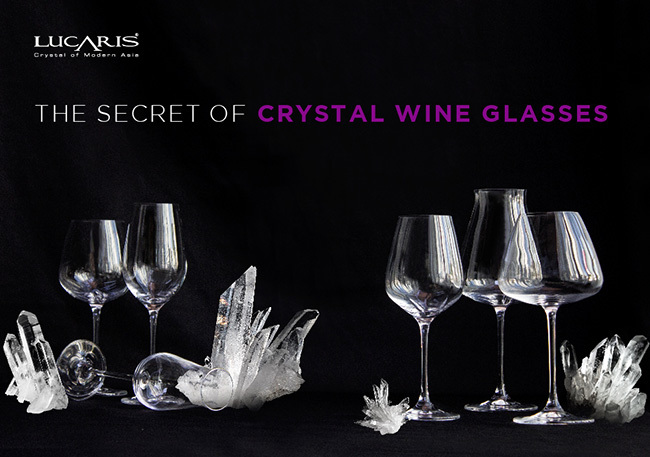 Here is the answer of all the questions about crystal wine glasses! What is a crystal glass? Typical household glass is made of silica sand, potash, and limestone while crystal glass uses the same method but has 24% of lead oxide added during the creation process. Crystal glasses were invented in 1600 by George Ravenscroft, an owner of glassware store in London, England. Because of their delicate styles, crystal glasses quickly became internationally known and constantly being developed into what crystal wares are nowadays. 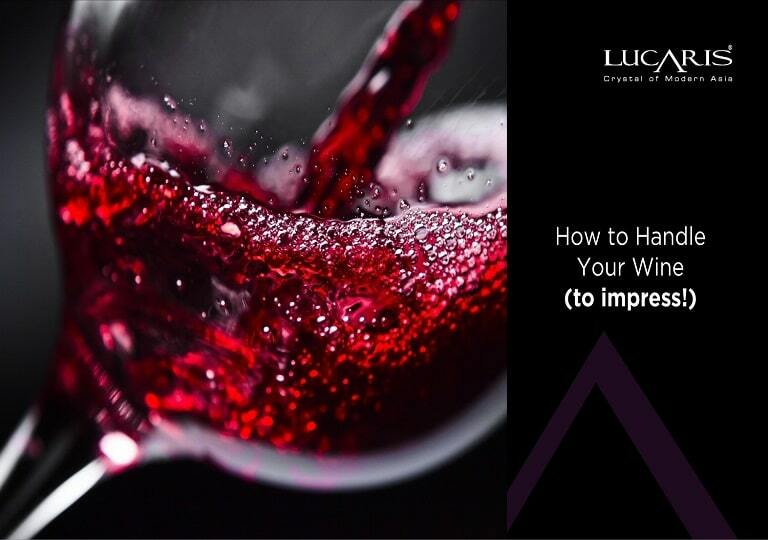 Many of you might question whether crystal glass with lead contained is safe for us wine lovers especially when it is produced as wine glass or decanter that is used to store liquid substance such as wine for a quite long time. Although there is no official research claiming that a crystal glass is dangerous for usage, but in terms of production, lead oxide is very harmful to environment and production staff. An awareness of hazardous lead oxide and incoming health trends encourages glassware business owners to create lead-free crystal glasses that are similar in physical appearance, clarity, and durability to normal crystal glasses but not harmful to our health and the environment. What about crystal wine glasses that are on the shelves in shopping centers? How can you trust if those glasses are lead-free? To relieve your worries, Lucaris is your absolute answer! 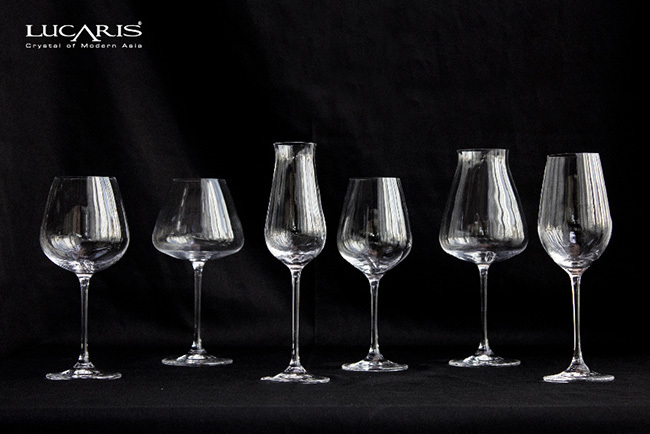 All the Lucaris crystal glasses are lead-free and barium-free which are safe for our health and environment. 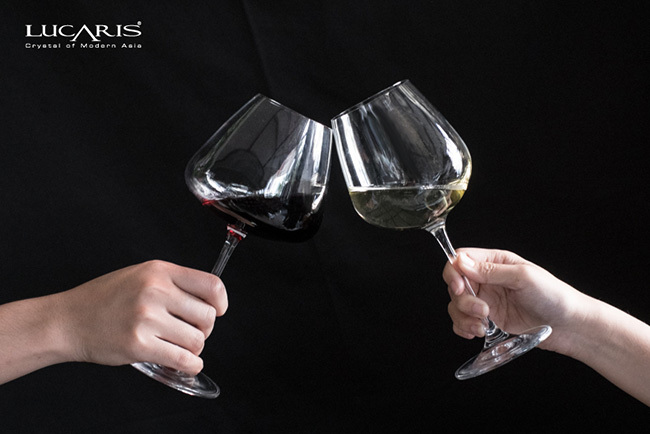 Thickness : A crystal wine glass will always be thinner than a regular wine glass to ensure that a wine lover will be able to enjoy drinking wine to its fullest. 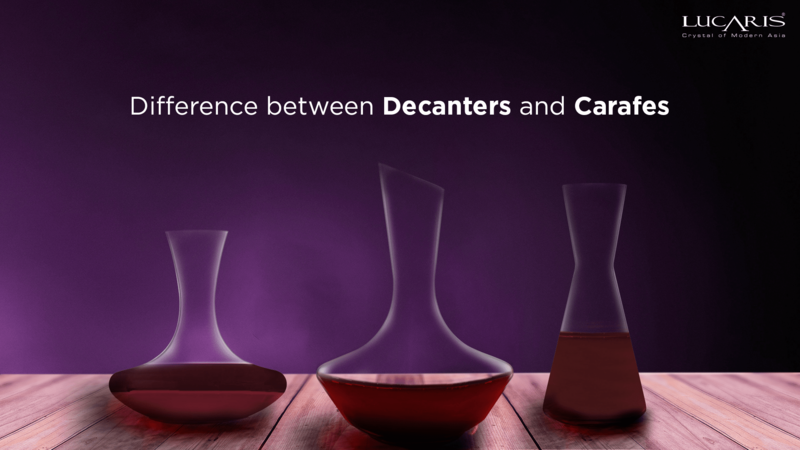 Clarity : One reason why a crystal wine glass is more popular than a regular wine glass among wine lovers is because of its clarity. Clarity of a crystal wine glass is considerably clearer than normal wine glass and therefore there is no interruption for discovering colors of wine. Weight : Another trick to distinguish a crystal wine glass from normal wine glass is to hold both glasses at the same time, and whichever glass is heavier will always be a crystal glass. Sound : The sound “clink!” during toasting is another charm of a crystal wine glass that normal wine glass can’t do. A crystal glass will always produce better sound than a normal glass. 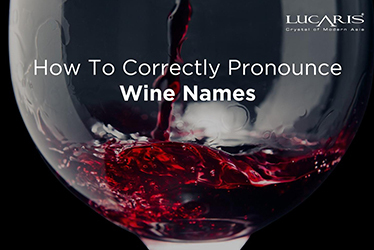 This can be tested by simply wet your index finger and then lightly rub your wet finger along the rim of a wine glass. Another possible method is to do a toast between two glasses. Toasting between crystal glasses will create vibrant sound whereas dull sound is a result of toasting between normal glasses. However, please keep in mind that toasting between wine glasses could potentially result in injuries if not careful. Thus, our next topic is to teach you how to do a proper toasting without risking your beautiful hands! Believe it or not, if we are forced to toast, a lot of people will choose to use the rim of a wine glass, and since the rim is extremely fragile, not only it will be broken easily if we are not careful enough but we likely will make a mess and embarrass ourselves as a result. So what is a proper way to do toasting? Practice makes perfect! 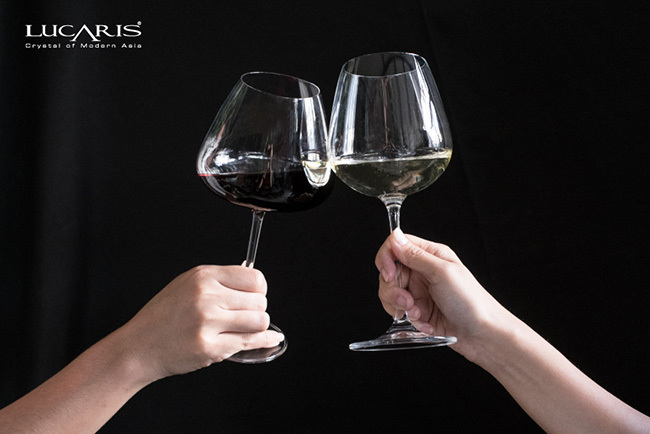 You slightly tilt your glass bowl first while your partner stays in the exact position, then both you and your partner must lightly toast and if you are doing it correctly you will hear a perfect crystal clear sound of interaction between two wine glasses! Good thing about toasting is to prevent wine from spilling. 1. 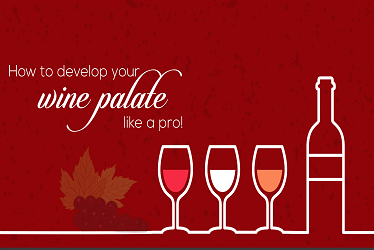 Always arrange the similar size of wine glasses together to protect a wine glass from colliding each other. 2. Clean food and lipstick stains before putting into a dish washer. 3. Always put wine glasses at the very top compartment of a dish washer. 4. Height of a dish washer compartment should match the height of wine glasses so that they can be set firmly during the washing process. 5. Set the temperature of your dish washer to low heat and turn on “Glass Friendly” mode. 6. Never take wine glasses out right away after your dish washer is finished. Always let wine glasses steam themselves for a while. 7. To clean water that is still on wine glasses, use micro-fiber towels. 1. Before cleaning wine glasses, make sure your hands are clean and always have towels nearby you. 2. Always clean wine glasses with warm water and not with detergent. 3. 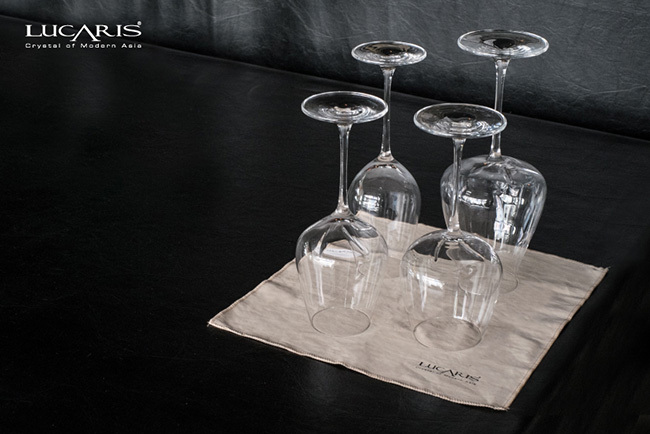 Dry wine glasses by putting them upside down on a linen cloth. 4. Steaming wine glasses helps maintaining wine glasses’ clarity. 5. 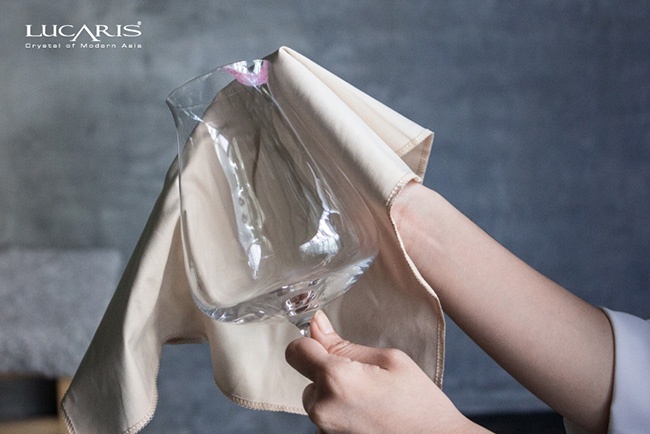 Only use micro-fiber cloth to clean wine glasses. 6. 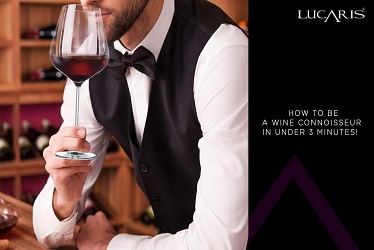 Use your left hand to hold a wine glass while your right hand does the cleaning. Try not to rotate wine glass because its stem might be damaged.